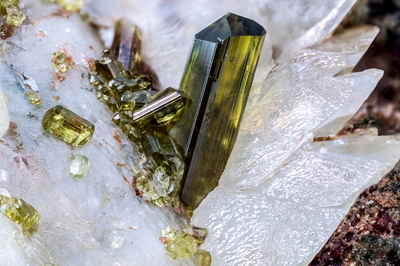 On fan-shaped crystals of cream-colored titanite, crystals of various dimensions of vesuvianite, whose color varies from oil-green to brown, have grown. The largest vesuvianite crystal shows an irregular development of the faces. Collection and photo by Gianfranco Ciccolini. Nikon D750, bellows, Luminar 25 mm.